Former Tour de France stage winner Magnus Backstedt says Team Sky should make Geraint Thomas their lead rider for the Vuelta a Espana. Chris Froome is considering bidding to be only the third rider to complete a French and Spanish Grand Tour double. But after supporting Froome in Le Tour, Swede Backstedt believes Thomas, 29, should be given his big chance in La Vuelta. "There's more to come from Geraint," Backstedt, 40, said. "I certainly hope they give him the opportunity with the back-up of a team that's clearly capable of looking after a rider to have a go at the general classification. "I would like to see that being in the Tour of Spain this year." The three-week long Spanish Vuelta, in which Froome finished as runner-up in 2014, starts on 22 August. Thomas finished 15th in the Tour de France having been fourth up until the 19th stage where his efforts finally took their toll. 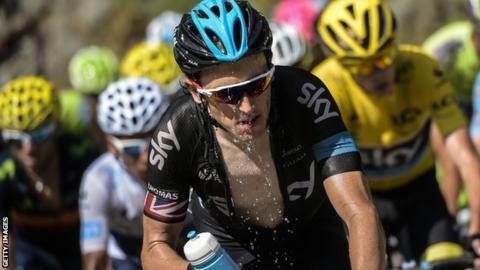 The Welshman was was praised for the support he gave Team Sky leader Froome, who secured his second title. Cardiff-born Thomas said his performance at the 2015 Tour de France has given him confidence that he can lead Team Sky in a Grand Tour in future.